We bring forth Rawl Bolts in different dimensions to meet varied requirements of our buyers. 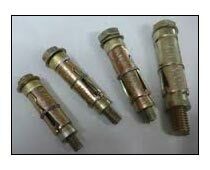 Our company is one of the eminent Suppliers of Fastener Bolt in Delhi. Buyers can get them from us at economical prices and in bulk. Our entire range is directly sourced from renowned OEMs who adopt Good Manufacturing Practices to maintain international quality standards. Thus, the Rawl Bolts we make available are structurally stable, reliable and render long service life.